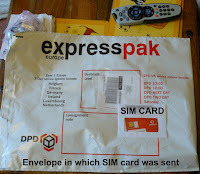 I got a new SIM card for my phone today (the work one), you know SIM cards? They’re small. They usually come attached to a credit card sized piece of plastic to keep them safe. This is the envelope in which it arrived. Sorry about the shaky picture, low blood sugar at the time, the Sky+ remote is artfully placed so you get a sense of scale, and the SIM card is on top of the envelope. Feel free to click the picture for a (large) version.